Hello everyone! We had a productive and fun week at BMS. The twos have developed an interest in robots this week. Monday we had karate, took very good care of Carrot, our classroom bunny, played so hard in the sandbox, and explored the sensory aspects of water beads. During snack time and lunch time, the children wanted book after book. They are developing literacy skills daily and have become much more invested in storytelling and imagination. Welcome Luca! We were so excited to have Luca start at 13th St. He has been at Tribeca for the beginning of the year, but now that he is two he is joining our little 13th St. family. Be sure to say hi to him and his dads, Victorio and Philip. Obstacle course Tuesday! The children were able to follow step by step directions to complete an obstacle course. We worked on gross motor skills, focus, and sequencing. The children had to throw two balls through a hoop, take the hoop to hop on several different mats across the room, then put the hula hoop around the stuffed giraffe's neck. Last but not least was giving a teacher a high five! To celebrate everyone completing the course, we had a dance party to "Let's Dance," by David Bowie. Here is a four minute video of the children being their very best creative selves. It's long, but worth a watch, especially with your child! In Spanish, we talked about robots and emotions. We also started learning the names for the colors in Spanish, by picking the corresponding robot to each color. After Spanish, we made a fort and played with water beads in the sensory table. 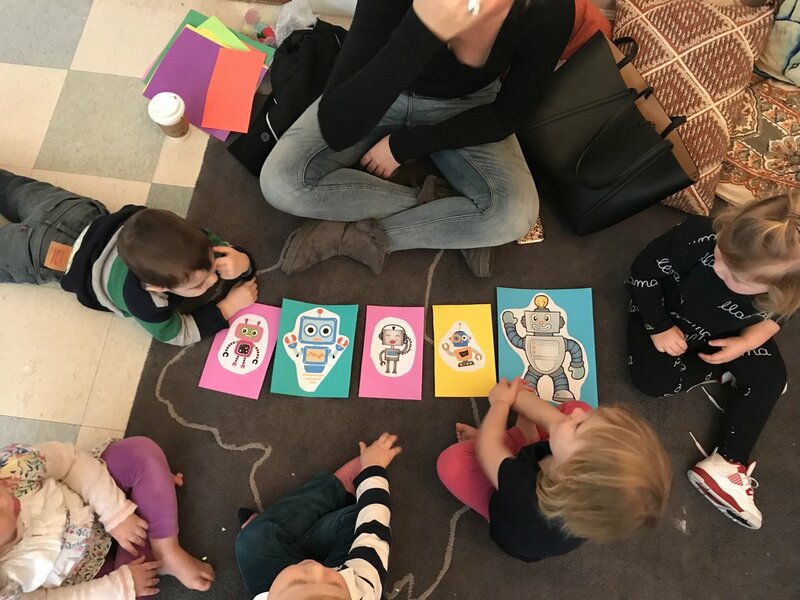 During Spanish, the children started assigning emotions to each of the robots. This integration of two preferred topics sparked conversations about further curriculm planning and we are going to incorporate multiple different domains of learning within those two interests of the children. On Thursday we had music with Evan. We had such a great time moving all around that we decided to keep moving and dancing in the middle room. We built another fort with the fabrics, but this time we danced underneath of it and pretended it was an umbrella. Henry was worried that his head would get wet! Nora said that she liked getting rained on and she didn't want to go under the umbrella. We liked how the friends made choices about what they wanted to do and how they wanted to move their bodies while pretending. Meanwhile, the children went to the back room in small groups to read some books about robots with a teacher. A favorite book is the "Robot ABCs." It introduces sounds that begin with each letter of the alphabet. For example, the "P" robot says, "puff, puff, puff." The twos loved it and are intreged by both the alphabet and robots. George- "My robot has a trumpet."